All I can say is wow! I have loved all of the comments that my blog received over the last few days. I am really going to miss not having an email every time I look at my phone! I loved all of your responses about binding. I normally cut my strips at 2.25 inches and I generally like the binding to stand out unless the quilt is really crazy :) I also enjoy hand sewing the binding to the back, it is probably one of my favorite parts of the quilting process. 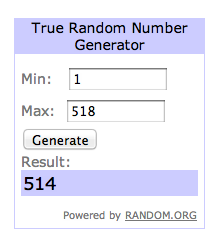 Out of 518 comments, the winner is . . . .
One of the very last comments was made by Nancy Sue . . . Thank you for visiting my blog and thanks for making me laugh with your comment! I am sending you an email so send me your mailing info and I will get the fabric in the mail to you ASAP.